ESTER: Hello and welcome! I’m so excited to chat with you two, especially now that Ms. Businesslady[formerly of the Toast] is going to be writing a monthly column for The Billfold. Can you both introduce yourselves and say a little about how you got into the advice column business? ALISON: Hi! I started Ask a Manager nine years ago when I was a manager at a nonprofit organization and was seeing lots of situations where I felt like people would get better outcomes for themselves if they had more insight into a manager’s brain. I didn’t really know if there would be an audience for it, but I thought it would be fun to do for a few months and see what happened. It turned out that there’s apparently an audience for more nuanced advice than what’s often in the career space. There’s a lot of “how do I ask for a raise?” and “what should my resume look like?” advice out there, but not a lot of “how do I deal with this very specific, nuanced situation going on in my workplace?” That’s become a focus of my site in a lot of ways. The site sort of took off, and in 2010 I left my job and struck out on my own. Now I do management consulting for nonprofits and a bunch of writing on various workplace topics — including, obviously, Ask a Manager. BUSINESSLADY: I’ve always been an advice column junkie: AAM, obviously, but also Captain Awkward, Dear Prudence, Carolyn Hax, Miss Manners, Ask a Queer Chick, and others. After my job switched from full-time to part-time, I decided advice-columning would be a fun side gig. My rationale was that I’d accrued enough random workplace experiences to do a decent job of it, from a “your friendly, slightly older coworker” perspective. I pitched it to The Toast — and like Alison, I had no idea if it would actually take off — but then apparently it did. ESTER: Fabulous. First off, I wanted to talk about INTERNS, re: Alison’s Q&A with an intern who was so surprised that a super reasonable request to revise the company’s dress code resulted in that intern, and all the others who signed off on the petition, getting fired. I saw your update today, Alison, which I thought artfully dealt with the underlying disgust older generations have for Millennials. You pointed out that you didn’t think this was an issue specific to young people or indicative of a moral failing of an entire swath of the population. Still, that’s how lots of audiences have taken it. Do you think what struck a chord really was the schadenfreude element, the ability of some more smug / more savvy employees to look at a situation like that and tell themselves, Phew, at least I didn’t mess up THAT badly? Which is ultimately such a waste of everyone’s time, and can feel really mean-spirited after the first couple people have made that point. With the interns’ petition, obviously they made a poor choice, but at the same time I’m sure they all learned a valuable lesson! And I’m so curious about the lone intern who didn’t join in — how vocally did they push back against the herd, and what was the overall dynamic like in that office? ALISON: Yes, I want to know that too! I wish the lone intern who didn’t participate would write to me. ALISON: One thing that’s too bad about that letter is that it pushed out all reasonable discussion of dress codes. I actually think most dress codes are pretty silly. There are some exceptions, like if you work with clients who expect a certain type of presentation, but in general I’m not a fan of them. But that message didn’t really get a chance to come out, because the real point of that post wasn’t about dress codes; it was about how you make change happen in an office and when you do and don’t have standing and when it does and doesn’t make sense to push back when you hear no — and about how to pick your battles wisely. ESTER: Have either of you ever tried to change something about your workplace? And were your efforts ever successful? 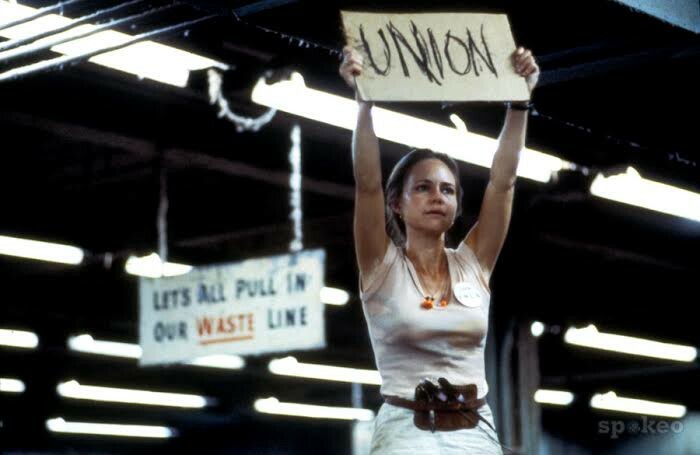 BUSINESSLADY: I’ve never gone full-on Norma Rae at a workplace, but there’ve been times when I’ve helped bring about certain process improvements. I’ve worked for the same place for a while, so before I started here, I didn’t really have the seniority to advocate for major changes. Now I kind of understand How Things Are Done so there’s not much to push back against. ALISON: I’ve always been pretty outspoken, and probably more so as time has gone by. But you have to recognize that your effectiveness at changing things is going to be directly tied to things like your seniority, what kind of credibility and track record you’ve built up, your relationship with your manager (it helps to have a manager who really likes you), how reasoned an argument you’re able to make — and especially how well you factor in the other side of the argument. You could have the most compelling argument in the world, but if you ignore all the reasons the thing you want to change is currently the way it is, you’re pretty likely to fail. You could have the most compelling argument in the world, but if you ignore all the reasons the thing you want to change is the way it is, you’re likely to fail. I have failed plenty of times. Once when I was 20, I banded together with coworkers to try to insist that our highly dysfunctional office hire a new manager because the person who was supposed to be managing — who was deeply loved by the head of the organization — was horrifically incompetent. We were terribly shocked when it didn’t go our way. I think that was my first lesson that work isn’t a democracy. BUSINESSLADY: I’ve also definitely had a few times when I decided it was worth making a stand about something, even if I knew it wasn’t likely to actually result in a change. Kind of a “for the record…” dissenting vote. I think that’s part of why people were so head-shakey about the intern thing. Even if you decide to speak up, you’re never guaranteed to get the reaction you’re hoping for. So part of the problem there was the assumption that petition = automatic change. ALISON: I think that’s exactly right. It’s fine to speak up if you think there’s a better way to be doing something. But continuing to push after you’ve been told No is something you need to do really carefully. ESTER: It can be tricky for people just starting out in the workplace, I think, to realize what gets read as “taking initiative” and what gets read as “being pushy and presumptuous.” At my first job, at a talent agency in New York, I was put in a perma-temp role, running a voiceover booth full-time. After I’d done it for several months and made quite a success of it, I realized that running the voiceover booth could be its own job, and I tentatively suggested that. I was slapped down. Several months later, the company did it anyway — created the job and, of course, gave it to someone else. Who I trained. I remember my frustration so keenly, in part because I really wasn’t sure what lesson I was supposed to learn. Should I not have given them the idea? Should I have been less direct — planted the idea but made a manager think it was his? ALISON: It’s really hard to know when you’re just starting out how to calibrate this stuff correctly. Hell, it’s hard to know that even when you’re more experienced. In your case, Ester, I think where they really failed you was in not explaining the situation to you. Maybe there were legitimate reasons for how it played out — like maybe there wasn’t the budget when you first suggested it but later there was, and maybe they put someone else in the role because that person had some specific skill they wanted. If they’d talked to you about it and explained why they did it that way, I bet you would have been left feeling better about the whole thing, and maybe even felt more confident about speaking up about ideas in the future. ESTER: So what kind of mistakes did you two make when you were starting out? What makes you wince to remember? BUSINESSLADY: In terms of cringeworthy mistakes, I once printed out an Excel spreadsheet across several pages, then taped them together. That’s such a minor thing in retrospect, but I remember my boss being like, “Why would you think this was the right way to do this?” and just feeling so ashamed of myself. ALISON: Oh god. I was a nightmare to manage in my first professional job. That was the dysfunctional office that I mentioned above, and I think my coworkers and I fell prey to a sort of mob mentality, where as a group we convinced ourselves that our positions on things were so inherently righteous that we could just push and push. We were … not clear on our roles in the organization, I’d say. By my next job, I was much better, but I did insist on calling a much older coworker Mrs. ___ rather than using her first name like a normal person would. Also, in high school I once quit a job by just not showing up anymore. That was especially weird because they had loved me and been really nice to me and thought I was some sort of model adolescent (I was very much not), and then I just ghosted them for no reason. ESTER: Can you tell us more about the job you ghosted? ALISON: It was a Mrs. Fields Cookies, which is basically the greatest food service job you could have because everyone is happy when they’re buying cookies. And I had no good reason for it. They were lovely to me there. I can’t defend any of my decisions as a teenager; I was basically walking around in a fog of self-absorption, books, and rage. BUSINESSLADY: Haha, it’s definitely not my worst mistake, but it stands out for some reason — just because I felt so stupid in the moment. In general, the things that stick with me are incidents when a higher-up essentially questioned my judgment, along the lines of “what were you thinking?”, prompting me to realize that I hadn’t actually thought things through. That stuff lingers in my psyche more than other mistakes. ALISON: Yeah, I think if you’re a conscientious person, it’s mortifying when that stuff happens. Which is good! It means you’re conscientious and invested in your work. You can now read Part II here! An Advice Columnist Roundtable Featuring “Ask A Manager” and Businesslady, Continued! Questions for Businesslady? Send ’em our way, to dearbusinesslady@gmail.com. Questions for Ask a Manager? Send ’em to alison@askamanager.org. While we’re at it, if you have questions for Rambling Man, send those my way too, to ester@thebillfold.com! Let’s get Josh back to work.